Leave a camera-trap unattended and there’s a good chance that sooner or later it will capture wildlife in its midst. Capturing wildlife with an ordinary camera, however, takes considerably more time and effort. As any photographer will tell you, good wildlife pictures are hard to come by. They require technical expertise and, often, days or weeks of patient waiting. Take a rare bird, for example. First you have to be in the right place at the right time and, if you haven’t blinked and missed it, it’s usually too far away or, if close up, obscured by trees, twigs or grass. 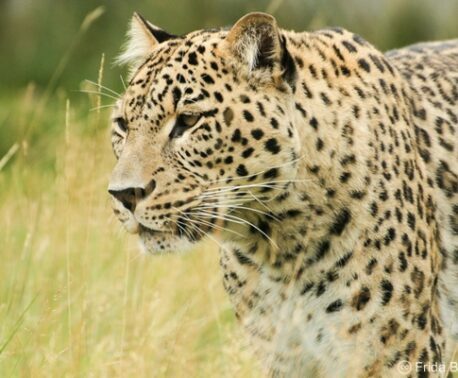 But just as camera-traps are now an essential tool for conservation and scientific research, so too is an ordinary camera in the hands of a good wildlife photographer. World Land Trust (WLT) depends very much on having wildlife images to illustrate the biodiversity of the nature reserves we have helped create, thanks to donations from our supporters, and we are grateful for all the professionals and individuals who allow us to use their photographs. In the face of a seemingly unstoppable wave of development – whether for agriculture, construction or industry – WLT and its conservation partners focus on identifying unspoiled and biodiverse habitats, and as long as we can raise the funds to save them we know that such places will remain wild and unspoiled. But fundraising cannot be done overnight and while WLT aims to save land as quickly as possible, during the period of fundraising we need to be able to demonstrate the value of the land and its wildlife. Being able to tell the story of life in the land, with captivating images of the range of species that make their home there, is essential. In 2011 and 2012 Steven Mcgee-Callender was a member of two Glasgow University research trips to Bolivia’s Barba Azul Nature Reserve in the Beni Savanna, which is managed by Bolivian conservation organisation Armonía, and supported by WLT. This was an extremely rewarding trip in terms of wildlife studied – and captured on film – and WLT is grateful that we have been able to use the expedition’s camera-trap videos and Steven’s photographs in our fundraising effort to save this wonderful wildlife region. Barba Azul Nature Reserve’s flagship species is the Blue-throated Macaw (Ara glaucogularis), and with such a charismatic bird in evidence sometimes other spectacular birds are forgotten. 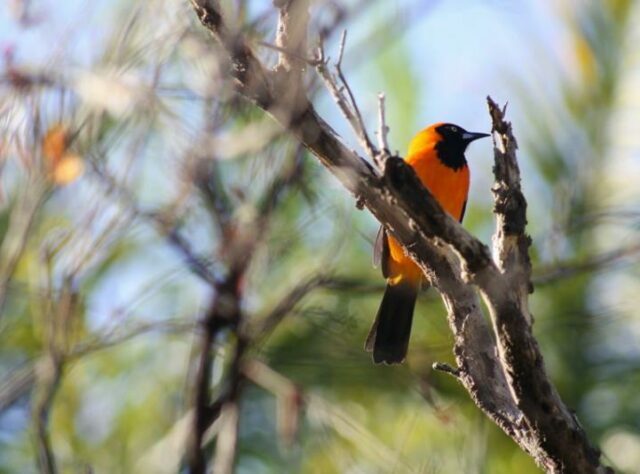 In addition to the Blue-throated Macaw, Steven photographed an Orange-backed Troupial (Icterus croconotus), a large oriole, with deep orange plumage and a black hood, tail and upperparts (pictured). His photos also record Burrowing Owl (Athene cunicularia), White-tailed Hawk (Geranoaetus albicaudatus), Black-collared Hawk (Busarellus nigricollis), Sharp-tailed Tyrant (Culicivora caudacuta), Black-masked Finch (Coryphaspiza melanotis), Fork-tailed Flycatcher (Tyrannus savana), Amazon Kingfisher (Chloroceryle amazona), Jabiru Stork (Jabiru mycteria), Seedeaters (family Thraupidae) and Golden-tailed Sapphire Hummingbirds (Chrysuronia oenone). While in Barba Azul Steven also photographed mammals as well as reptiles and fish on the reserve, including armadillo, caiman and piranha. The Crab-eating Fox (Cerdocyon thous), illustrated, is endemic to central South America. 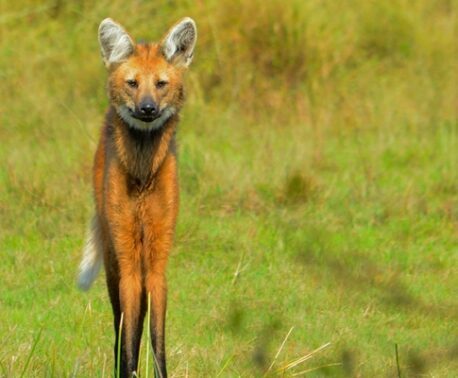 As its name suggests, this fox searches for crabs on muddy floodplains during the wet season, and is ideally suited to the Barba Azul’s seasonally flooded savanna.